These are only a few of what we carry. 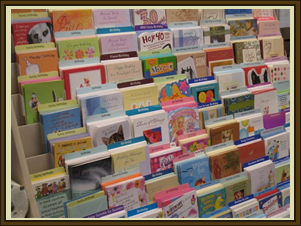 Come in and pick the card of your choice! We also carry Willow Tree, Habersham Candles, Webkinz, Toys, Jewelry, UGA Merchandise, Anniversary and Wedding, and much more. Come in and check out our Gift Department.